This Friday was my first time this season picking basil. Our target weight this Friday was 15 pounds for market and 4 pounds for restaurants. 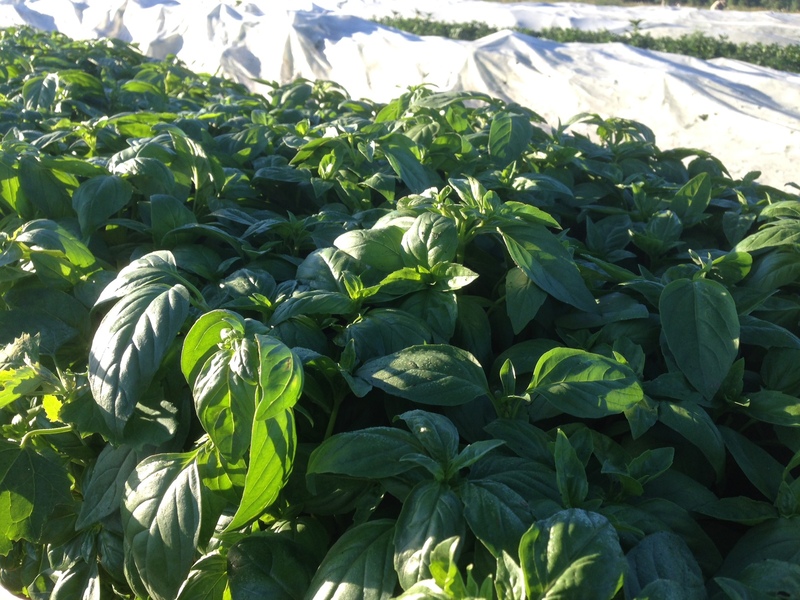 We have three beds of basil with four different types. Each bed is covered with a white slightly transparent cloth we call row cover. This cover helps protect the plants from the elements and from an creepy crawlies that are wanting to make a quick snack from the crop. The row cover is held down with sand bags. Along with the basil, many of our crops have row cover protecting them, so the fields sometimes resemble more of a white sea than the green fields one might envision. When the wind blows hard, this sea swells with remarkably uniform sine waves, which is quite mesmerizing. We start by uncovering the beds, which releases the sweet and savory smell of basil. I try to work with both hands, pinching. Sometimes I work with my right hand and collect a bunch in my left and then dump the contents into a small gallon bucket. One bucket weighs, to my best estimate, about two pounds when completely full. These three beds will continue to grow and will soon resemble more of a hedge of basil than anything- close to waist height. By then, we barely have to bend over at the waist to pick. By the time we were through with harvesting, everyone’s thumb nails were blackened from the juices of the stems. On to the next crop on the harvest list. Sugar snap peas….